Today’s ‘April daily photo‘ is the bronze plaque on the front of the Yorkshire Museum, in the Museum Gardens. 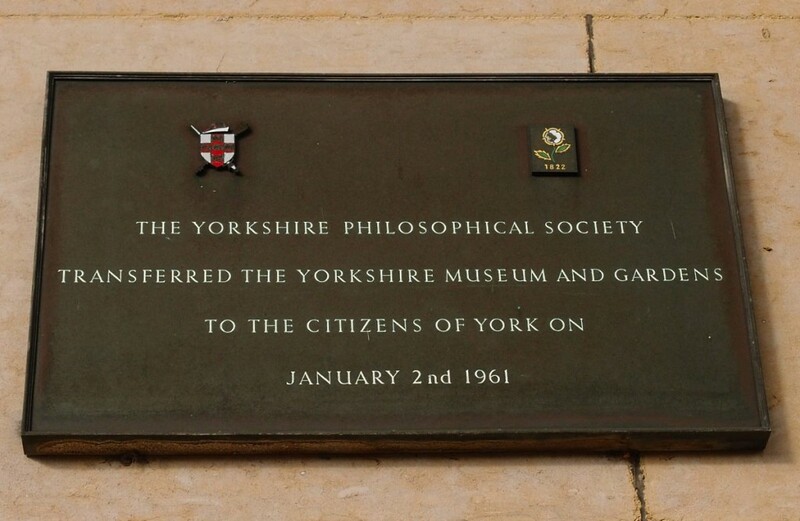 It informs us that ‘The Yorkshire Philosophical Society transferred the Yorkshire Museum and Gardens to the citizens of York on January 2nd 1961′. I’m pleased to see it’s still there, despite all the changes. And it’s a heartwarming message isn’t it. To think that these things are ours, that they’re owned by us, the citizens. Though of course it’s the local authority, the City of York Council, that owns these things, really. Kind of on our behalf. And then it has been complicated somewhat by the fact that York Museums Trust (YMT) has come into existence since these important assets were given to the citizens/local authority. The confusion last year over entry charges to the art gallery and museums made more of us think more about the role of YMT and the relationship between them and the council. It made me wonder who owns what, and also whether there’s a publicly accessible record of YMT meetings and decisions, similar to the records for council meetings which are available online on the council’s website. I still don’t know the answer to that. But it may be of interest to the citizens of York to note that the council’s Executive meeting on Thursday 28 April includes an agenda item relating to YMT. It’s a packed programme, including the previously mentioned Goose Management Scrutiny Review (Final Report). It’s not only the geese that have a Scrutiny Review Task Group scrutinising them. There’s also a York Museums Trust Scrutiny Review Task Group, and its report is number 6 on the agenda, just after the goose thing. There’s more information about the meeting on this link. The report itself is on this link (PDF). Readers may remember that last August the Press ran a story headlined ‘Trust mooted idea of entry charges to Museum Gardens, claims councillor‘. I thought about writing about it at the time, but wasn’t sure what angle to take as the story seemed to be riddled with subtexts and hidden (or not so hidden) agendas. Reading between the lines it looked like one of those things where someone may have said ‘of course we could … (do whatever)’ without any intention of doing it, merely raising the point that this was technically possible. It seemed such a ridiculously unacceptable idea that I couldn’t believe it would ever happen. But then I notice, visiting the Museum Gardens, how much more money must have been spent on it in recent years, how much more ‘posh’ it is. The recent cafe plan for the pavilion being just a part of that. And it seems important not to be complacent, particularly now, as we know, our York Cards no longer give us free access to the YMT managed gallery and museums, including this one pictured above. I’ve had a quick look through the report, looking for references to the Museum Gardens in particular. A fairly lengthy list of the ‘Core Partnership Objectives’ includes ‘Public access to the Museum Gardens’, but it doesn’t explicitly state that this will be ‘free public access’ or ‘public access without charge’. Perhaps the meeting will clarify that point. This story has parallels in the story of The Kings Book (of York First World War heroes). Donated by the compiler to the Council for the people of York. Now in possession of the Minster Library – they want to charge residents to make use of the information. Many local historians are hot under the collar about this. Thanks for adding this, something I wasn’t aware of. On a general point, regarding charges for accessing these ‘resources’ (whether art, local history resources etc), something I’ve been thinking about a lot is how they’re often defended as being ‘reasonable’ charges – but how this is usually decided by people on good salaries, who appear to have no awareness of how their ‘reasonable’ looks like ‘too expensive to justify’ to many people.